Goldenseal is West Virginia’s magazine of traditional life and is a quarterly publication of the West Virginia Division of Culture and History. 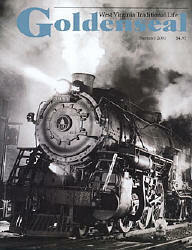 An article on the history of Coalwood appeared in the summer 2001 issue of Goldenseal magazine. Below, we have reproduced the press release announcing the article as well as the article itself. We would like to thank John Lilly, Goldenseal editor, and Dr. Stuart McGehee, author of the article, for giving us permission to reprint the text of the article here. Dr. McGehee is Professor and Chair, West Virginia State University, History Department. World famous as the site of Homer Hickam, Jr.’s, book “Rocket Boys” and the film “October Sky,” the McDowell County community of Coalwood is featured in an article, “Historic Coalwood,” in the summer  issue of Goldenseal magazine. The article, which was written by noted West Virginia coal historian Stuart McGehee, is an insightful account of the rise and fall of this historic coal company town. McGehee traces Coalwood’s history from its founding in 1902 as a company town for the Carter Coal & Coke Company, through its rise to national recognition as a model mining community in the early 1930s, to its gradual decline due to mechanization and global competition. At its peak, Coalwood was home to some 2,000 southern West Virginians and trailed only a handful of coal-producing centers in the state of terms of productivity and employment. Coalwood changed owners a number of times, McGehee writes, and was briefly operated by the U.S. Navy in the turbulent years following World War II. Mining continued in Coalwood throughout the 1950s and 1960s, the years chronicled in Hickham’s popular books “Rocket Boys” and “The Coalwood Way” and in the upcoming “Sky of Stone.” The Coalwood mines eventually closed down in 1986. “There was a breeze coming down the hollow. The dogwoods low on the mountain waved as if asking me to look at their glory. They were like white bouquets God had stuck in the stands of ancient oaks and hickories, glistening green in their own new growth. I heard something and looked up and down the road for its source. It wasn’t just a single sound. It was Coalwood, moving, talking, humming its eternal symphony of life, work, duty, and job. I stood alone on the side of the road and listened to my town play its industrial song.” —from Rocket Boys, by Homer Hickam, Jr., copyright 1998 by Delacorte Press. The phenomenal success of author Homer Hickam, Jr.’s, autobiographical Rocket Boys, and its subsequent film version “October Sky,” has drawn renewed attention to the southern West Virginia coalfields. Fans of the popular coming-of-age book and movie enthusiastically make the arduous trek down Routes 52 and 16 to visit the McDowell County hollow where the remarkable story took place. This new interest invites a closer look into the unique and fascinating world of Coalwood, a historic West Virginia coal company town. Coalwood was the proud product of George LaFayette Carter, one of the few natives of Appalachia to strike it rich when industrialization came to the mountains shortly after the Civil War. Carter was born in 1857 in Hillsville, Carroll County, Virginia, the eldest of nine children of a disabled Confederate veteran. Young Carter learned the bookkeepers’ trade. He married well, as they say, wedding his storekeeper boss’ daughter. A shrewd, natural businessman, Carter invested wisely and became a conduit for New York capital eager to develop the booming turn-of-the-century Appalachian industrial economy. Holdings in timber, coal, iron, and railroad stock soon made Carter a key player in the evolving industrial development of the rugged and remote mountains. From his Johnson City, Tennessee, base, the private and unpretentious entrepreneur expanded into Kentucky and southwest Virginia, purchasing banks, newspapers, mills, and factories. His charitable and philanthropic contributions helped build East Tennessee Normal School, now East Tennessee State University. In 1905, Carter bought some 20,000 acres in McDowell County’s “smokeless” coalfields, and began constructing an industrial community out of the wilderness. He named it Coalwood. The low-volatile, low-sulphur #4 Pocahontas coal seam there was the world standard for metallurgical and steam fuel. The seam stood some six feet high, but required a heroic, 600-foot deep shaft to reach the heart of the mineable reserves. Carter built a wooden tipple, company houses, offices, and a store to supply the needs of his workers; the nearest community of size was Welch, an arduous and circuitous 10 miles away across several devilish ridges. The first coal came up the shaft in 1905, and by 1907, Coalwood mined some 200,000 tons annually. By 1915, nearly one million tons ran out along the Norfolk & Western rails each year from Coalwood, through Bluefield, to Lambert’s Point at Norfolk, Virginia. There, the N&W maintained a huge dockside port facility for shipping Coalwood’s product — what the railroad proudly termed “fuel satisfaction” — around the world. The abundant and economical energy from the southern West Virginia coalfields helped transform America from a rural, agricultural country into the urban industrial giant of the 20th century. Carter Coal & Coke Company, as the Coalwood operation was called at the time, trailed only the huge conglomerates of the Pocahontas Fuel Company and United States Coal & Coke in southern West Virginia in terms of productivity and employment. Soon, Carter opened a second operation at Caretta, across the mountain from Coalwood proper. The 1917 West Virginia Bureau of Mines Annual Report included a fascinating snapshot portrait of Carter’s creation. According to the report, 500 miners at six separate mine openings produced over half-a-million tons of coal, hauled by 12 mules and numerous electric gathering locomotives. Carter and his family lived in the clubhouse in “downtown” Coalwood, and he personally supervised the largely white, racially homogeneous workforce. By the 1930's, Coalwood was recognized nationally as a “model town,” where management invested wisely in the quality of life of its employees and reaped the benefits in increased productivity and relative labor contentment. The Washington Post noted in December 1936, “It is a town in remarkable contrast to surrounding villages where squalor and poverty are the word. With houses painted and surrounded by flower gardens and lawns, it looks more like an alpine village than the begrimed coal towns of most of America.” There was never a major disaster – morbidly calculated by the industry as the loss of five or more lives at one time – in Coalwood, yet roof falls and haulage accidents resulted in some 50 deaths in the town’s first 75 years. In West Virginia’s often ghastly and macabre coal industry, this was considered an acceptable rate of “tons produced per fatal accident.” African American coal miners were grossly over-represented among the injuries, reflecting the reality of life underground in racially segregated America. In 1933, Consolidation Coal defaulted on its annual payments to Carter, and the property reverted to the original coal operator. Although George L. Carter died in 1936, his son James W. Carter continued as general superintendent of what became the Olga Coal Company in 1946. Phenomenal productivity continued as the operation employed 1,300 workers, utilized mechanical loading machines underground, and averaged a staggering two million tons per year throughout World War II. The centrality of the coal industry to American economic development was starkly illustrated when the United States Navy briefly took over the operation of the facility during the industry’s post-war slump and attendant labor unrest. Coalwood and its sister town Caretta remained highly productive coal operations well into the late 20th century. Around 500 miners — many of whom now took advantage of better roads to live elsewhere and commute to Coalwood — produced on average around one million tons annually. 1983's Pocahontas Coalfield Centennial Celebration featured a lengthy television program on Coalwood, including a fascinating interview with retired foreman Homer Hickham, Sr. Eventually, however, mechanization, petroleum competition for the global energy market, and the exploitation of more easily mineable coal seams in faraway Wyoming made Coalwood increasingly less profitable. The LTV steel corporation, which owned Olga by 1980, shut down the mine in 1986, laid off the remaining 200 workers, and sold the houses to the employees who remained in what rapidly became a bedroom community for other mines still running southern West Virginia coal. The once-thriving model coal town now entered into a period of relative uncertainty. The failure of the unincorporated community’s public service system in 1989 resulted in an investigatory Appalshop film, “Ten Miles to Fetch Water,” and its superintendent was convicted of environmental violations and sentenced to two years home confinement. Recently, though, things seem to be looking up. Sparked in part by the notoriety of hometown author Homer Hickam, Jr., a renewed sense of pride has developed among former and current residents. Some 500 former Coalwood residents gather each year for a huge reunion in Hillsville in southwestern Virginia — the hometown of George L. Carter — to celebrate the close ties of family, community, and work which still unite them. In 1991, the parent LTV corporation arranged for the company records, photographs, and other documents to be deposited in the Eastern Regional Coal Archives in the Craft Memorial Library in Bluefield, where they attract genealogists and coalfield historians alike. The payroll books alone tell a remarkable story: the story of Homer Hickham’s Coalwood, of coal miners’ West Virginia, and of hard-working Appalachian America.